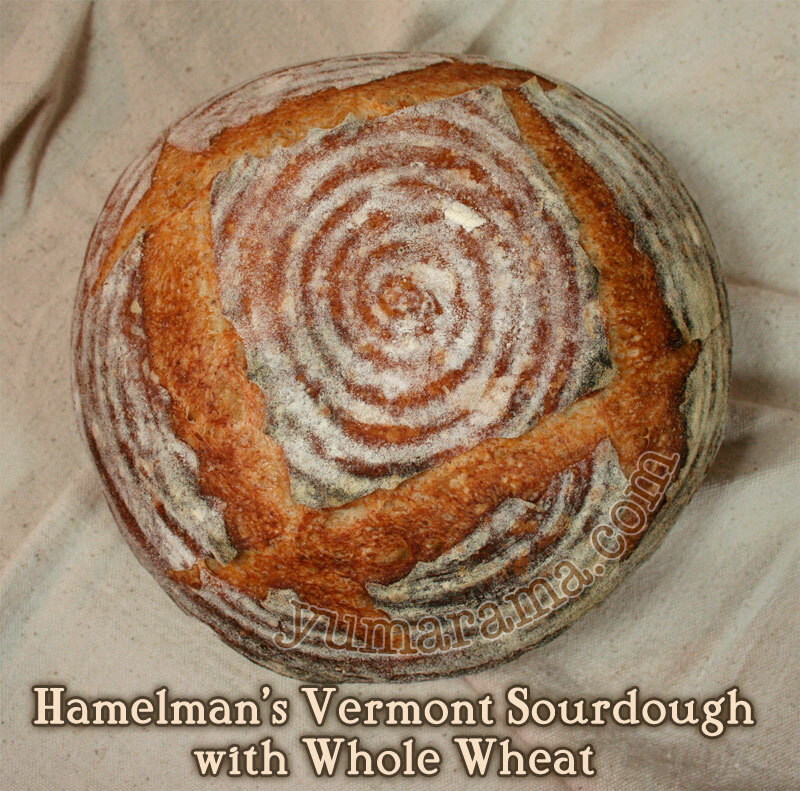 One of the breads that came up in the June list for MellowBakers.com was the Hamelman Vermont Sourdough, a bread I’ve made before a number of times and posted about here several tries on the blog. 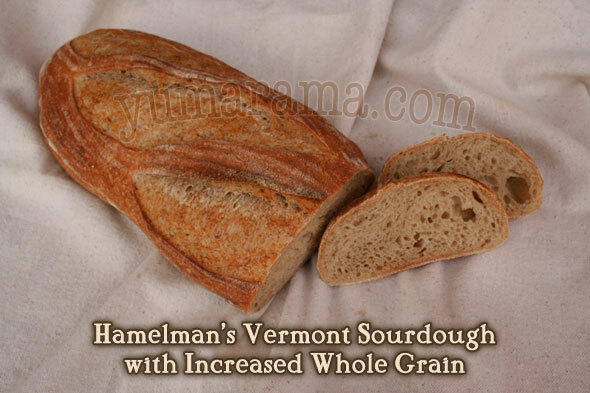 The cool thing, however, is that because we’re group baking through all 85 recipes in Hamelman’s awesome book Bread: A Baker’s Book of Techniques and Recipes, we are amalgamating variations on a recipe so in this case we had not only the standard Vermont Sourdough but also the Vermont Sourdough with Whole Wheat and the Vermont Sourdough with Increased Whole grain. Since we’re supposed to be “Mellow” bakers, we can choose which, if any, of the three varieties we will make. I decided: all three. Since I’ve done the straight up VS already, I wanted to give the other two types a go and see how they compared. 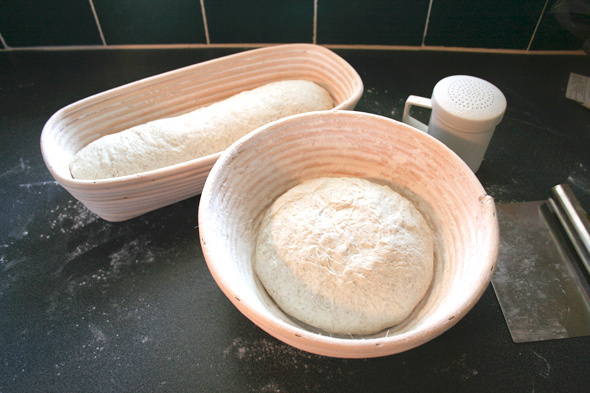 This still leaves two other breads for June: Pizza and Beer bread. I’ll try to get to those in the next few weeks. But let’s have a look at the Vermont Trilogy for now. As usual, the sourdoughs need a levain pre-ferment. 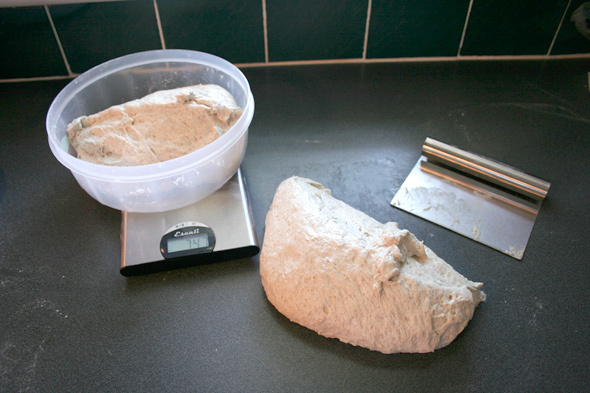 In this case, they were all made with bread flour, water and starter culture, coming out to 125% hydration. 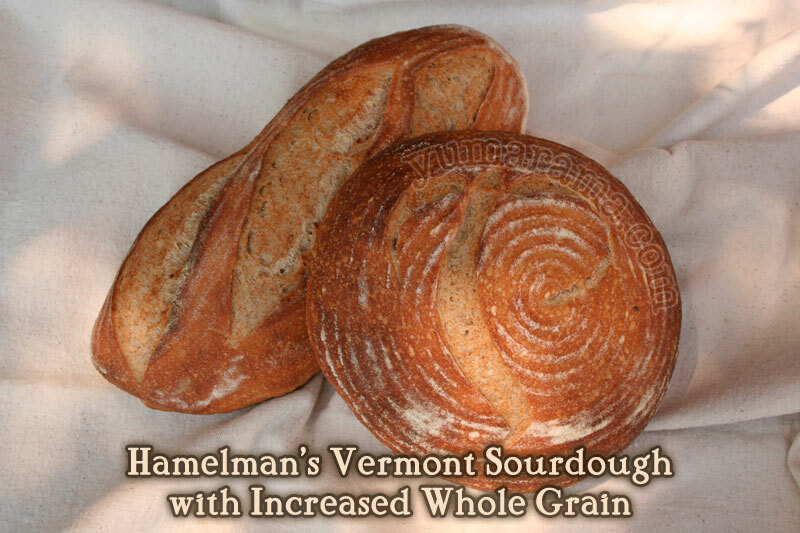 The difference was in the quantity with the Increased Whole Grain ending up with the largest amount (445g), the plain VS with 334g and the Whole Wheat with 306g. 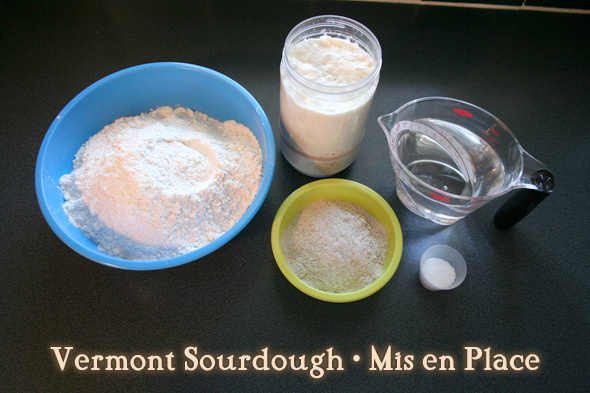 From there, the next difference was, of course, the flours included in each bread. 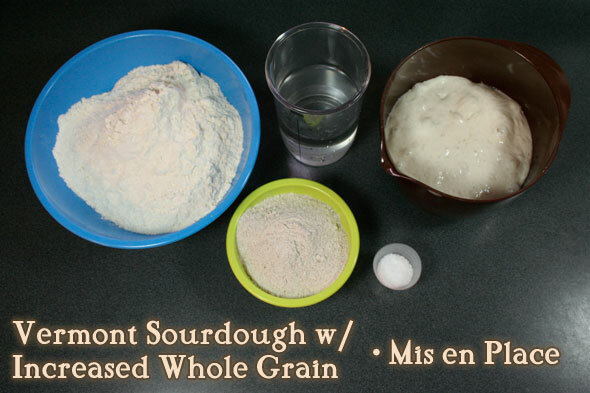 For all the breads we have unbleached bread flour (blue bowl), the starter, water and salt. 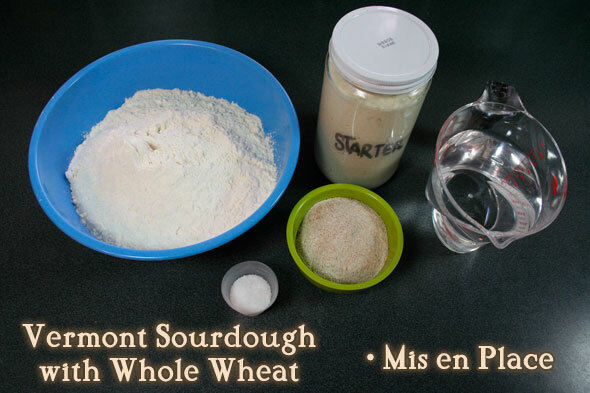 Then for the plain VS, we have a small addition of rye flour, for the Whole Wheat we substitute that rye for whole wheat, then for the Increased Whole Grain we go back to rye but increase the amount from 91g to 136g. Also, as you can see, the starter amount is a lot greater so we have much more yeast activity, although the water amounts in all three remains at 65%. Will these small variation really make enough difference to be noticeable? Well, that’s the question. 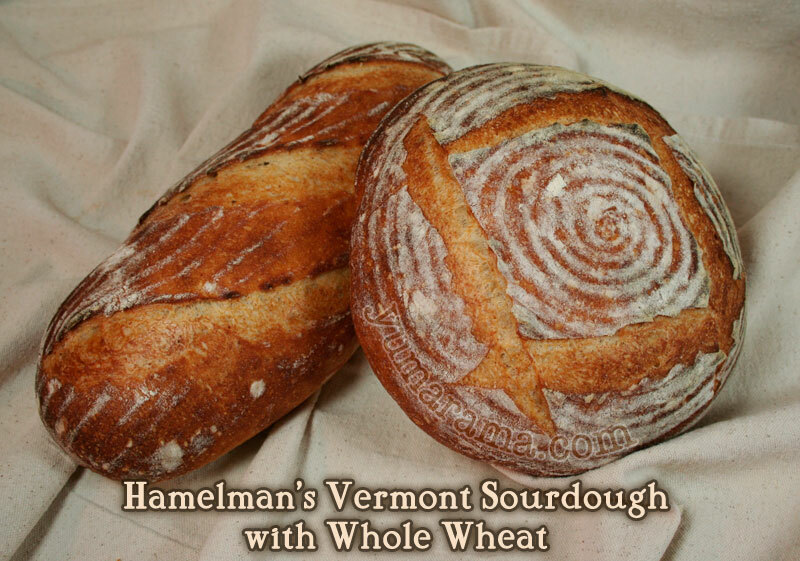 Baking up all three varieties and comparing them side by side would be a great way to tell. Sadly, that isn’t what I would do. These all had a week or two between them and I only had a small nub of WW left when the IWG version was done. I’ll report n that comparisson a little later. For now, we’ll do a quick round up of the process which was pretty much exactly the same across all three, unless noted otherwise. 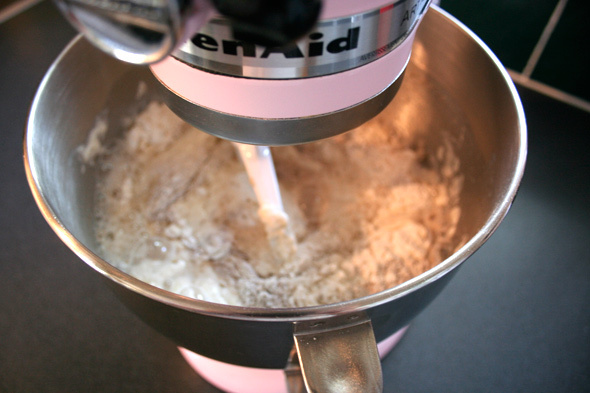 Mix all ingredients except the salt until it’s well blended and shaggy. Cover for 20 to 60 minutes (I did about 60) and let rest to autolyze. Then sprinkle the salt on top and mix for another 1.5 to 2 minutes. 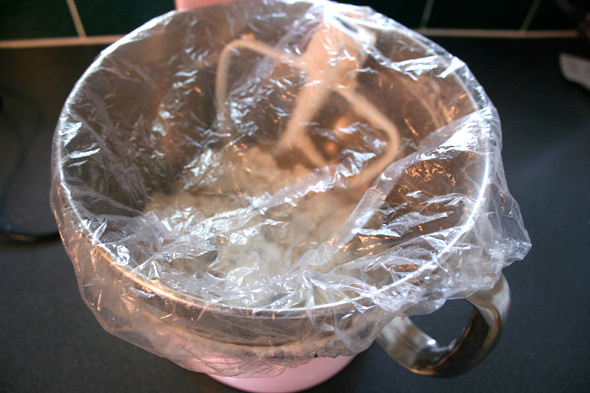 Transfer to a proofing bowl, giving one or two folds after 50 or 75 minutes, respectively. For the first two breads, I did two folds after 50 minutes. (You can review “Stretch and Fold” in the blog entry with lots of photo reference.) The IWG version specified, however, only one fold at 75 minutes. 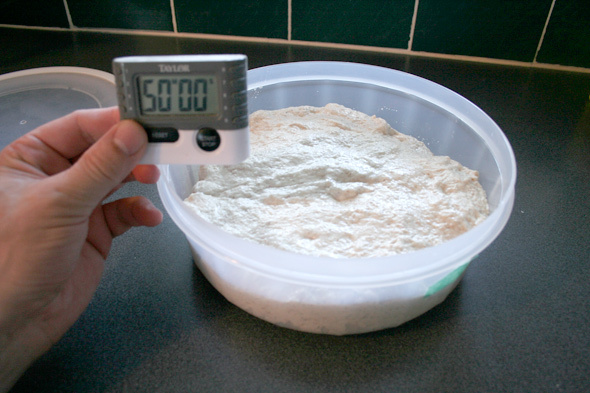 The bulk proof should be complete after 2.5 hours at which time the dough is divided in two loaves. 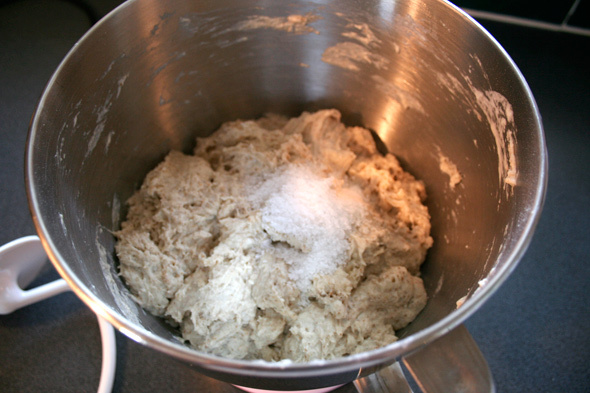 The dough is shaped and left to proof. I’ve chosen to use a rectangular and a round cane basket, just for fun. 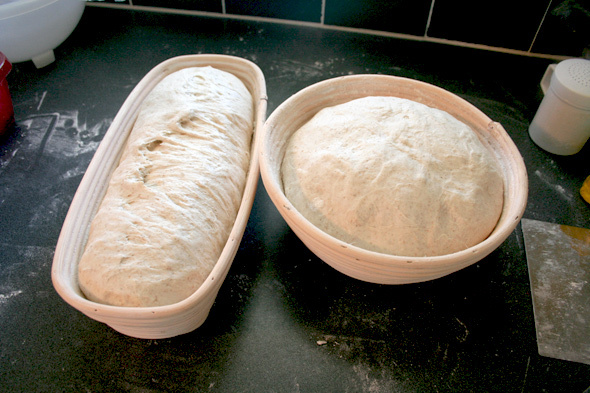 The first two breads we left to final proof for about 2 to 2.5 hours but the IWG dough got an 8 hour or so retardation in the fridge simply because it would have been the wee hours of morning if given a shorter proof. 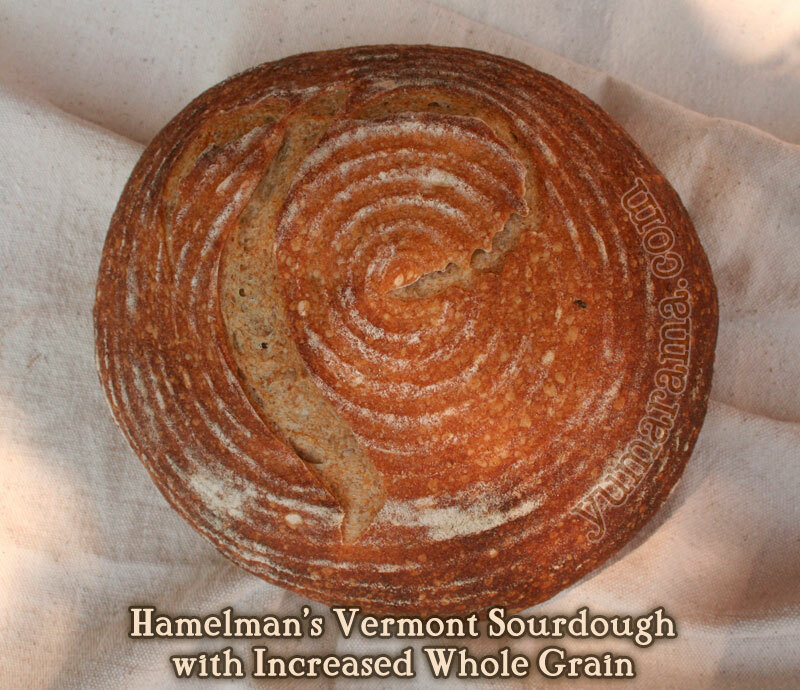 Once completed, the loaves were transferred to a pan and baked at 460ºF for 40 – 45 minutes with a shot of steam at the beginning then removed when they’d hit about 205ºF inside. So other than a small folding difference, the process was pretty much identical in all cases. Let’s have a look at the results. As noted, this bread I’ve made numerous times already but I was still very happy with the results here. 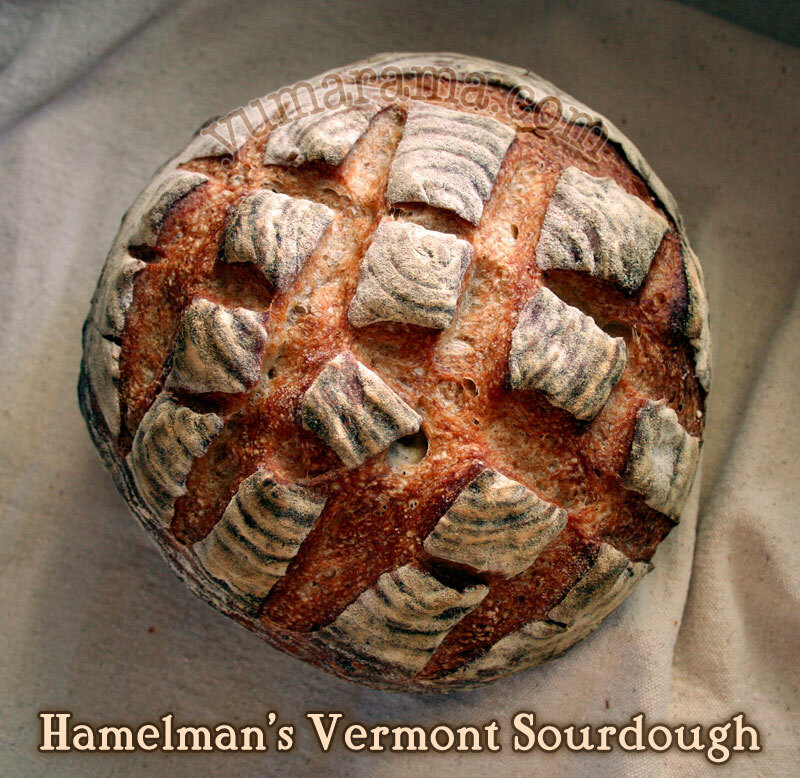 I tried, for the first time, a new slashing design on the boule and it came out quite well. The crumb on this bread was the usual one, a nice variety of medium to small holes evenly spread. The tang is notable but not terribly pronounced. The crust here, even on the rather robust checkerboard boule, was crispy, crunchy but not too thick or hard. Not store-bought white bread soft, mind you (which is fine by me) but not break-yer-teeth hard. A slightly darker crumb from the increased rye and a nice, slight tartiness, likely from the increased levain and the fact we’re dealing with rye and not the sweeter Whole Wheat. This time, the slashing was done with a new razor blade right into the just-out-of-the-fridge dough which made a huge difference in how (well) it slashed. And yes, the dough went straight from the fridge to the oven with no apparent problem. The crust was, once again, crunchy but not too thick although when it had come out of the oven directly, it was a very stiff crust. However after just a few minutes of cooling on the rack, the crust had mellowed out quite nicely. So which one of these is the best? All of them. Nope, I’m not picking one over the others, they were all really tasty. I had fully expected that I’d be giving away one or two of these since it’s a fair bit of bread in just a couple of weeks but they were all delicious enough to have pretty much vanished by bake day the next weekend. Which tells me, without doubt, that they all passed the Yum test. Sorry neighbours, maybe next time. 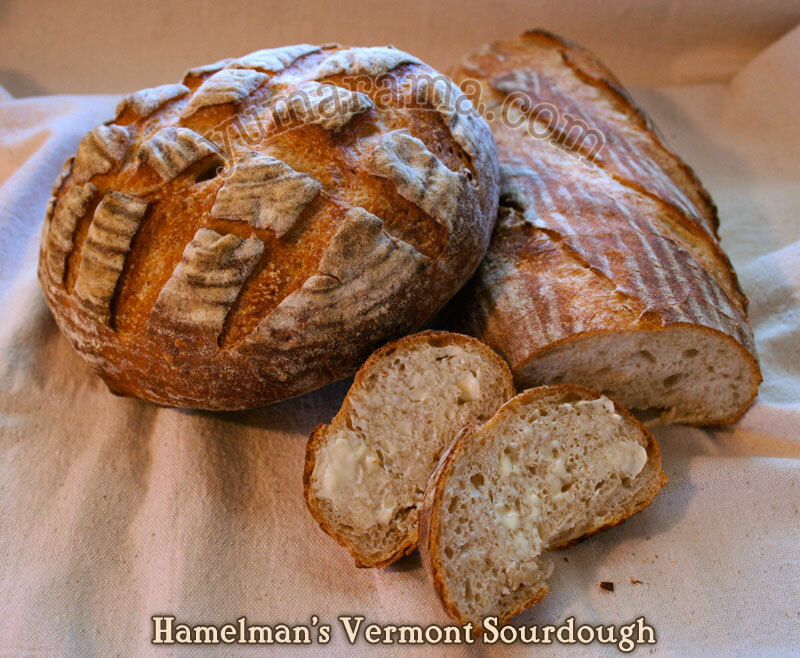 Hey, want to see what the other Mellow Bakers’ Vermonts turned out like? Well, go check them out! Coming up next: possibly Pizza… or Beer Bread, still not sure which. I think I’ll just surprise myself! They all look beautiful, Paul! I seriously think you should post a slashing tutorial on the forum . . . they all turned out so well. I’m a little sad that you won’t name one as the best . . . maybe that means I’ll have to bake all three to decide myself!? I can’t believe that none of them got donated to enhance the neighbors waistlines. Wonderful post. 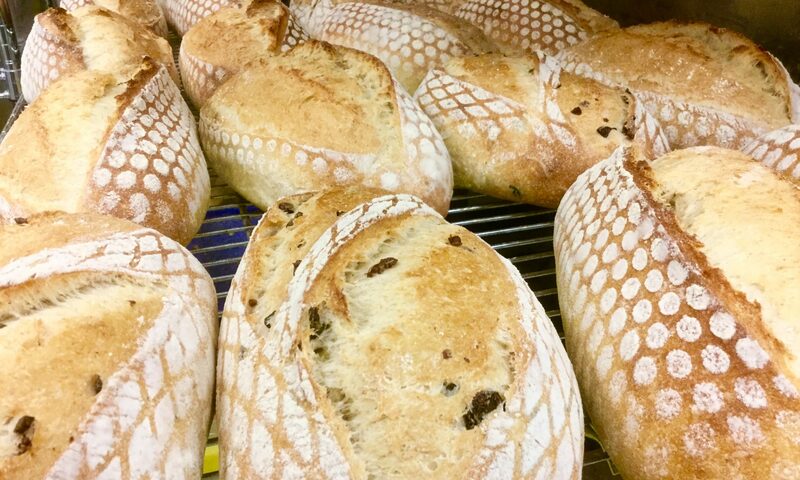 Beautiful, inspiring bread! Thank you! Stir it! Scrape it! Mix it! Bake it!